When the full-time whistle blew, Darren Randolph was left alone by the first wave of pitch-invading Aston Villa supporters. He made the slow walk towards the away section alone in his thoughts until the throngs gradually began to surround him. This was a grim end to a season that he will ultimately remember for two gut-wrenching play-off disappointments. He did little wrong at Villa Park last night in a 0-0 draw that secured a 1-0 aggregate win for Villa, just as he was hard to blame for Ireland's crushing defeat to Denmark in November. In fact, he was one of Middlesbrough's better performers, making a string of second-half stops to keep the game level when his side desperately needed a goal at the other end. Randolph has played every minute of Middlesbrough's league campaign, just as he was ever-present for Ireland's World Cup tilt. It may be a division down but, in some ways, it's a step forward from his uncertain existence at West Ham. Yet the Bray man finishes up with nothing to celebrate. For Conor Hourihane, the final whistle brought rapidly contrasting emotions. He was the only member of Villa's Irish contingent to start in a tense draw that keeps his dream of a Premier League breakthrough alive. On this evidence, it would be rash to make bold claims about the chances of success because Villa have a lot of improving to do if they are to find a way past a highly rated Fulham side on Saturday week. They have an explosive streak, whereas Villa's experience saw them through this 180-minute test. A defence led by John Terry succeeded in frustrating a 'Boro side that trailed from the first leg. Tony Pulis paced the sideline throughout, but his team was all perspiration and no inspiration. For two big clubs with Premier League expectations, an entire campaign's work rested on one game. Understandably enough, the atmosphere was highly charged. There was emotion too in a minute's applause for Jlloyd Samuel's following his death earlier in the day. It was followed by a game devoid of serious goalmouth activity. Large spells of mediocrity highlighted why both had failed in their ambitions to go up automatically. With the stakes high, the premium was on avoiding mistakes. Villa had negotiated the second half of the first leg by absorbing pressure and this was more of the same. Hourihane was tasked with providing energy in a midfield trio consisting of the grizzled veteran Mile Jedinak and flair player Jack Grealish. The Corkman was centrally involved in Villa's best first-half moment as he was poised to convert a cross from Albert Adomah only for George Friend to brilliantly clear the danger by taking man and ball. 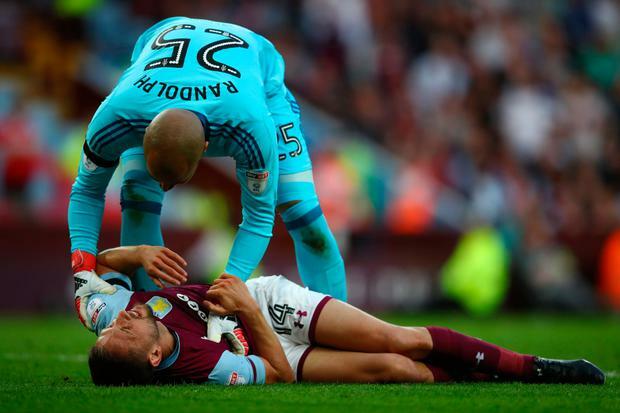 Hourihane lay stricken on the turf after the impact. Randolph went over to see if he needed help. It was brief respite from a frenetic affair, with the Irish colleagues conscious that their seasons would go in rapidly different directions. Hourihane recovered to stay on the pitch for 85 minutes, and the efforts were appreciated by the tense home support who gave him an ovation as Steve Bruce summoned Glenn Whelan for the final five minutes. Drama would follow, with Villa keeper Sam Johnstone fortunate to stay on the pitch when blocking a goalbound shot while outside his box. Mike Dean let him off and Stewart Downing's subsequent free came off the crossbar. It was out of play when Whelan met it on the volley to send it into the crowd and waste a couple more precious seconds. Villa weren't going to let this opportunity pass.